in sound but also in the Cultural/Political sense. ‘Upsetter’ label,Niney became chief engineer. ‘Observer’ label, saw it go on to become, Jamaican Record of the Year 1971. Far out selling Bob Marley’s track to the tune of over 30,000 copies in Jamaica alone. on the track 'Rasta Band Wagon' who's production credit read Perry, Niney,Maxie. doubled as his Studio of Dub. hard to recognise the track himself. HI - FI Sound System and it's these such tracks that we have compiled for this release. Ruddock A.K.A. King Tubby was gunned down and murdered on the 6th December 1989. An unreleased dub cut to the former Black Uhuru vocalist Michael Rose's 'Freedom'. A lost dub to Niney's and Dennis Brown's 'Lately Girl'. versions. This is the exclusive slow cut. A rare dub to Dennis Brown's 'I am the Conqueror'. 5. IN LOVE WITH DUB. A lost till now dub cut to Michael Rose's 'A love between us'. an alternative version that features a different bass line. 9. SWALLOW FIELD & DUB. 11. DARK SIDE OF DUB. A rare dub to Dennis Brown's 'Silver Words'. Niney cut this track with the Soul Syndicate band and Max Romeo cut a vocal version. 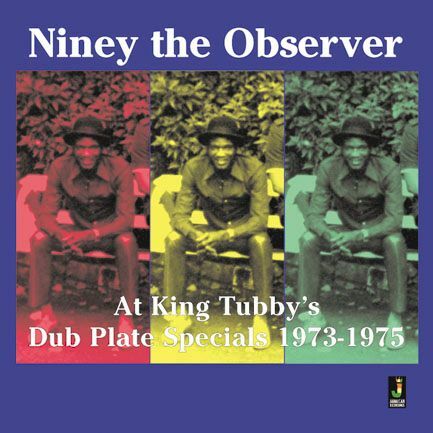 This is the raw instrumental dub cut by King Tubby. 3 SWALLOW FIELD & DUB. 5. DARK SIDE OF DUB. Joe Gibbs Studio Burns Avenue, & King Tubby’s. Produced by: Niney the Observer. Design by: Gary @ Voodoo London. Photography by: Jah Floyd Archive. All Titles published by Westbury Music. Manufactured under Licence from Winston Holness.